If you have a group or club that has people with lots of athletic shoes (e.g., sports teams, etc. 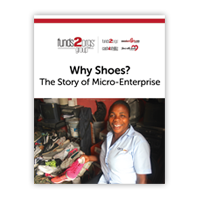 ), then the footwear can become money for you. 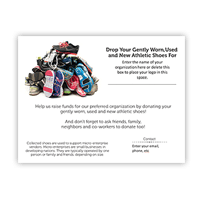 Your group can send the gently worn, used and new athletic shoes directly to Sneakers4Funds, the largest athletic shoe drive fundraising company in North America..
What do you get with no out-of-pocket costs for the Prepaid Shipping Bag shoe drive fundraising program? Have your supporters collect gently worn, used and new athletic shoes. Fill each pre-paid shipping bag with 10 - 15 pairs of gently worn, used and new athletic shoes. Simply take the filled bags to the United Parcel Service (UPS) store, and the bag(s) are shipped to the Sneakers4Funds warehouse. There is no cost to your group for shipping the bags of athletic shoes. Once the athletic shoes are received, a check is issued within 2 business days. 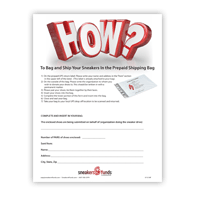 What is the Sneakers4Funds Prepaid Shipping Program? 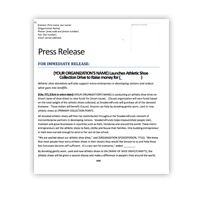 This unique program allows your supporters to send the athletic shoes they collect for your fundraiser directly to the Sneakers4Funds warehouse for processing. There are no out-of-pocket costs to you or your supporters for sending the bags directly to Sneakers4Funds. How does the Prepaid Shipping Program work? After you sign the agreement with Sneakers4Funds, you will receive special prepaid shipping bags for your supporters. Have your champions collect 15 - 20 pairs of gently worn, used and new athletic shoes. When the bags are filled, you simply take the bags to UPS. How long does it take for me to receive a check after the prepaid shipping bags are sent via UPS to the Sneakers4Funds warehouse? We know you want to receive your money quickly and to ensure that the program is cost-effective for you and Sneakers4Funds, you will be issued a check on a monthly basis for the bags received the month prior. 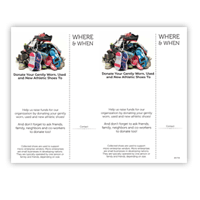 Each month, for the duration of your fundraiser, you will be sent a check by Sneakers4Funds that are reconciled based on the bags received at the Sneakers4Funds warehouse. Once your fundraiser ends, there will be a final check issued to you the month after the conclusion of your athletic shoe drive fundraiser. How will you know which bags shipped directly to Sneakers4Funds belong to my athletic shoe drive fundraiser? 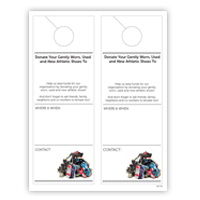 Each bag given to you has a unique identification number that is only provided for your specific fundraiser. The ID number allows our warehouse team to process and ensure controls for proper reconciliation efficiently. We want you to succeed. Based on our experience, the best partners are those that are sport-oriented, such as running clubs, fitness clubs, sports teams or groups. We also partner with corporations and businesses that want to make a difference in a creative way for a good cause. 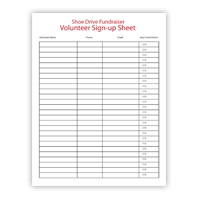 There's no time like the present to reach out to Sneakers4Funds to see how you can quickly raise money in an easy athletic shoe drive fundraiser.